where we each design a row depicting where we live and then make the pattern for the row and the best part is - you get it the patttern for free! And what's even better than a free pattern? 40 free patterns! Each of the 40 bloggers thru the month is giving her pattern away free ! Yes - FREE! and what's more is each blog has a giveaway! Just enter using Rafflecopter at the end of this post and then visit the other bloggers to enter even more giveaways. After you enter my giveaway go to visit the other 3 bloggers who share my day. I live in Vermont and one of the best things about living here is the changing of the seasons and the fact they are so different so I wanted my row to focus on that. 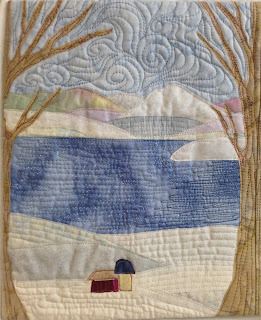 So basically I just took one simple landscape pattern and used different fabrics to show the season and connecting them with the trees. I could also see these being made as 4 seperate mini quilts to hang on the wall and be changed out for each season. 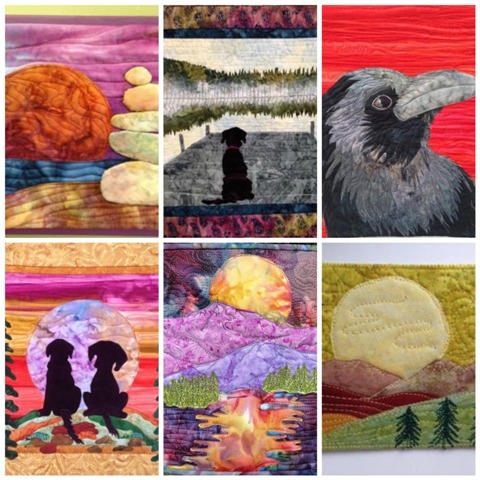 You could finish each one by binding them using the easy triangle hanging method or do a facing - OR mount them on a stretched canvas using velcro on the back to make it easy to switch up every season. click on the links to bring you to a free turorial on each method. This project is mostly raw edge or fusible applique. 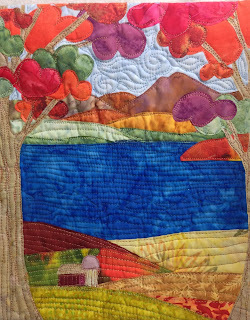 After fusing all the different elements in place you layer the backing and batting like anyother quilt and you applique everything down simply by your quilting process. That means lots of free motion quilting! Don't be scared of it! If you have never FMQ'ed then now is the time to learn. 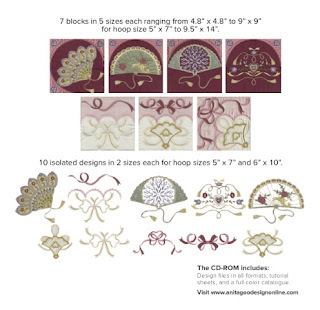 With this type of applique you are basically just going around each motif to hold in place. See the lines on the snow in winter? Just lines - you can do this! 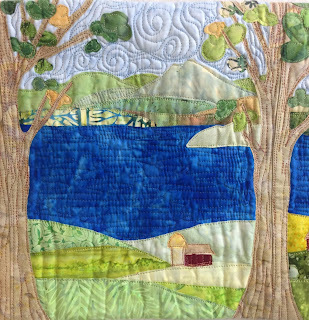 You might want to try doing just one scene making a mini quilt to start. You have nothing to loose but some time and a small amount of fabric. Your quilting world will never be the same once you have learned to free motion quilt - all it takes is practice. The pattern is available in my Craftsy shop - here. I read about this on a blog last week and she called it crafted applique. There is a book out on the subject called crafted applique - new possibilities that gives you detailed instructions. If you really want to try this and do it right you might want to buy the book. I'm the type that likes to dive in and experiment so that's what I did. First I "painted" the modgepodge on the back side of the fabric. Modgepodge is a white glue that dries fast and clear. It's used for decoupage. So back to the drawing board, this time laying the fabric on plastic. Some basic leaf shapes cut and laid on a background. I'm not taking any chances that some of the glue is on the front so used parchment paper to iron and yes, it does stick to the background just like fusible. That makes it easy to quilt. 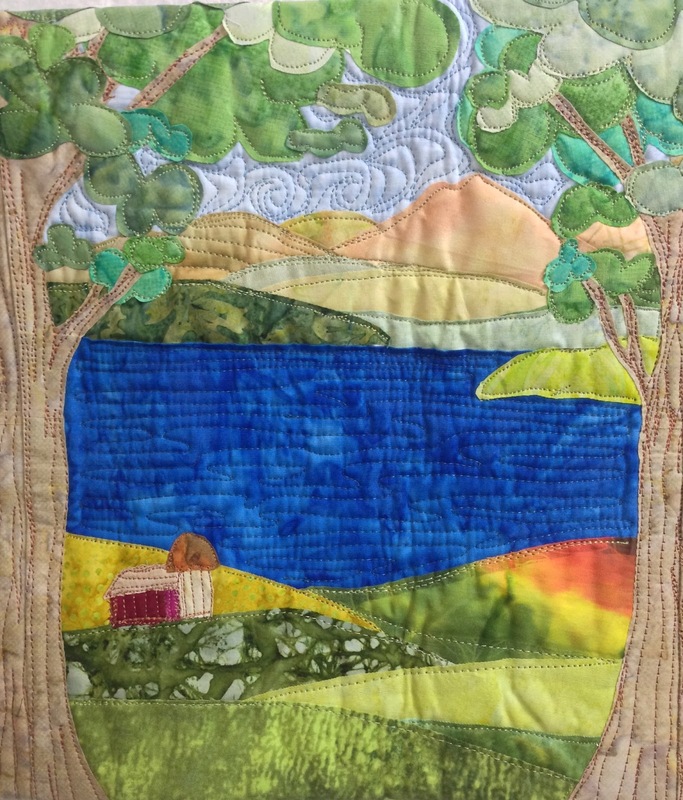 So her is is, quilted and finished. I made the stems small to see how it holds up under the machine needle. With fusible a small piece like this will shred under the needle but these stems held up nicely. The leaves felt somewhat stiff (as does fusible) so next step was to wash. The modpodge is water soluble so should wash out in the washing machine. Here it is after washing. It felt softer so I think at least some of the glue washed out. This was put in with a load of clothes so I'm thinking soaking in hot water by itself probablly would do a better job of getting all the glue out and making it nice and soft. If I were to make a baby quilt or any quilt that was to be washed a lot I would probablly do the applique with a zig zag stitch. 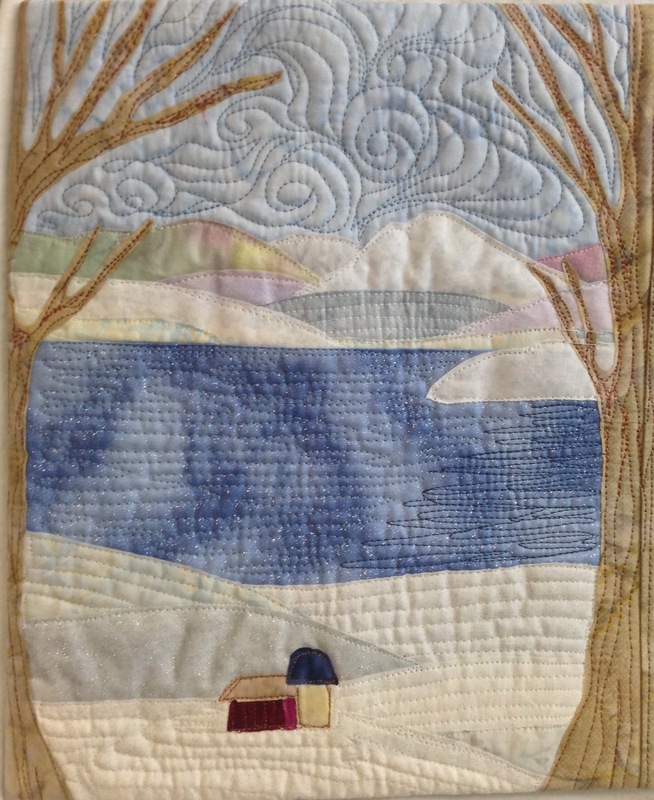 Most of my quilts are art quilts and aren't really washed so I just do the straight free motion. I wonder how zig zag free motion would work. Has anyone tried that? I would imagine it's slower to do but when making a mug rig or anything that will be washed straight stitch just doesn't do it. As you can see here, my stitches didn't really hold up in the wash and caused the waves. Also to be fair, the background is flannel which I'm sure shrinks differently than the batik I used for the leaves. All in all I like this technique especially for small bits. I will continue using my beloved fusible and freezer paper but will definately include the crafted applique technique into my "box of tricks"
I wrote a pattern for this beach mini geared toward the beginner. It's on sale for download on Etsy here or Craftsy here. These little art quilts are simple and each one can be so different that I'm on my 4th one and still enjoying it. Every time I go to the beach I'm always picking up something - a shell, some driftwood and this is a way to use them. This is a night one - check out those cool beads! Those squished up things on the left is supposed to be sea grass but I squished them to much maybe? I also should have used a more solid grass like color. Live and learn. I show how to make the sea grass in my pattern as well. This one is WIP. Quilting is done and I couched on some yarn and crocheted it so some strands hang down like flowers or vines. I'm really liking this. Reminds me of my vacation in Maine last spring. There was a stone wall like that at my hotel next to the beach, so there I am all beautiful with flowing dress with the wind in my hair and a glow on my cheek. Of course in reality it was April and cold so it was more like sweatpants, jacket hat and gloves but this is my quilt, my fantasy. She was originally a fairy and I know this sounds like I am the evil wicked witch of fairyland, but I cut off her wings and now she is a mere mortal. Any way go check out the pattern - it's only 6 bucks! I took this photo while walking on the beach at ausable point on lake Champlain a few weeks ago. Love the colors and feel so had to try to make a quilt. I sketched it out on the shiny side of freezer paper. Using a sketch and wash pencil. This kind of pencil can be used to draw on just about anything and sketching on the shiny side saved me a step of doing it on paper then tracing to the freezer paper. Used the freezer paper as my pattern for applique pieces, clipping corners and folding under. That one piece was bigger than my fabric so had to piece it in two parts. I'm hoping it will blend in enough not to notice. The pinkish piece above is #1 which is the water and I tried to break it up with some light blue tule. Not sure if I like it or not but worth a shot. Bouncing on some white paint with an old paint brush helps a lot. I like it. Also brushed on some sandy looking paint. That's as far as I've gotten as of this morning so will hopefully show you the finish next week. 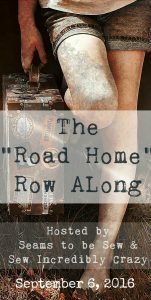 BTW - the road home row along starts this week. 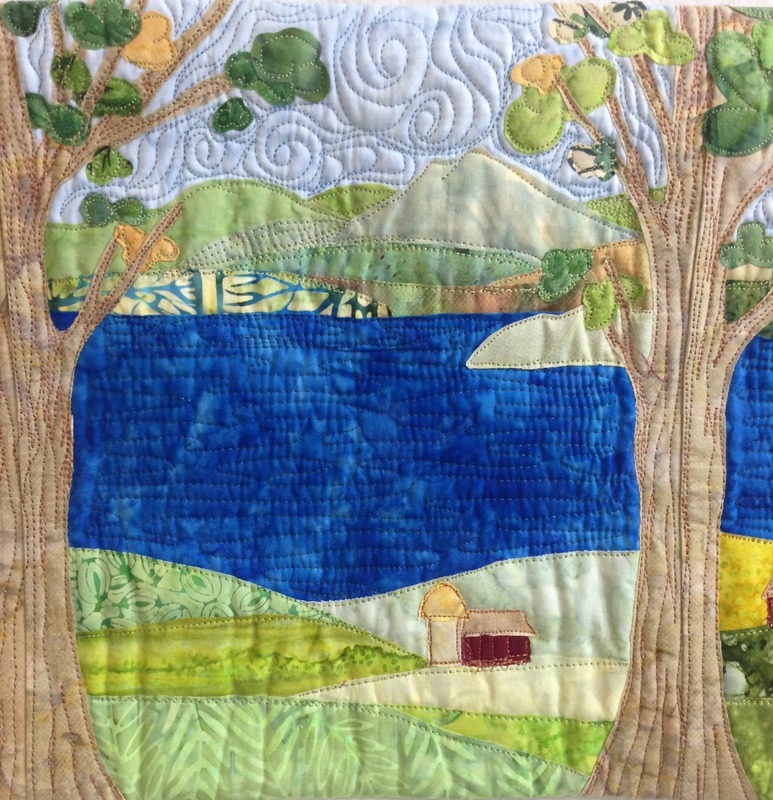 A whole bunch of bloggers are designing a quilt row each having something to do with where they live. There are people from all over the US and the world so should be interesting. There are also giveaways so check it out. It started this week and goes all month. I am participating and my day is Sept 29th. I saw a guy selling peg looms at the quilt festival and if it involves fabric, of course I want to try it. My father is a very good woodworker so instead of buying one, I gave him the plans and my most loving daughterly smile and he made me one. The loom is basically a block of wood with pegs that are inserted in drilled holes that can be taken out and put back in easily. Each peg has a hole. You take a length of twine or string and thread it through, tying the two ends together at the bottom. You can use fabric or wool and being a quilter have lots of extra fabric to use up. I tore some yardage into strips. It would be a lot neater if it was cut but I didn't want to take the time wanted a more rustic look. You probably should sew all the strips together to make one long strip all nice and neat but again I was lazy wanted that rustic rag look. You tie one end like this. Once you fill the pegs you lift each peg out of the hole, letting the weaved part drop down and put the peg back in the hole. The strings hold the whole thing together. Then you just start weaving again. And keep going until the strings are full or you get as big as you want it. This is as far as I've gotten as of this morning. I ran out of the blue strips so started some white. Let's see how the two toned look is :-) it's a bit of a mess right now but I will trim the strings when it's done and will have the finished rag rug for you next week. Still learning how this thing works. I want to experiment with different fabrics too. I wonder how fleece would be? Flannel?